St Petersburg concerts include an exciting mix of top-notch Russian performances and musicians that everyone gotta see. Throughout the year the city of St Petersburg hosts a large number of remarkable concerts of classical music, opera, orchestra, and jazz to please everyone's ears and eyes. Usually, all the major St Petersburg concerts are taking place in beautiful surroundings and historical palaces in a baroque and neo-classical style setting, right in the heart of the city, so with easy access on foot, by metro, or by taxi, depending on where your hotel is situated. The beauty of attending these annual musical concerts and events are not only the great venues where they play, but also how they play. The quality of the music performed by the Russian musicians is really top-notch, and the diversity of the programs featured are very interesting and suitable for any music lover who wants enjoy a lively performance. Honestly speaking, if you’re on a visit to the Venice of the North, you can’t miss a philharmonic or a classical music concert, and its amazing acoustics or opera singers. Therefore, if you’re up for a unique musical experience find out below where to go for the best St Petersburg concerts. Ready to go? If so, take a look below at our picking list of best venues for St Petersburg concerts, and choose where to go. The Concert hall of the Mariinsky Theatre was opened by President Putin in 2006 and is a purpose-built concert venue with superb acoustics and stage management systems. Many private Russian people and companies contributed to the project and as a result locals and visitors alike can hear unique performances by world-acclaimed orchestras and artists. The building was extended and now, in addition to the concert hall, there is a restaurant, a café, a music shop, and rehearsal studios. The foyer of the Concert Hall is in constant use as an exhibition space with regularly changing exciting exhibits. Tips: Bring your own refreshments and make sure you buy your tickets well in advance. Shorts and t-shirts are not permitted. The Grand Hall of the St Petersburg Philharmonia houses 1500 patrons and is one of the best concert halls in Europe with first-class acoustics. The Small Hall also boasts perfect acoustics and seats 500. Two restaurants complete the venue, a café where you can enjoy a Tiramisu or Danish crumpet with fresh fruit or a cappuccino before the concert, or a restaurant which is open for lunch, dinner and evening meals. The interiors are lavish - ornate wall panelling, parquet flooring, white marble columns under crystal chandeliers. Mobile phones must be checked into the cloakroom so that all can enjoy the music in peace. Tips: The Great Hall of Philharmonic is a beautiful place to see - even without the music. However, find a concert you are interested in, and try to get ticket. There are also very cheap last minute tickets, where you can sit any available seat. Shorts and t-shirts are not permitted. "Caters For All Age Groups"
The monolithic Oktyabrsky Grand Concert Hall was built in 1967 and has a nostalgic feel of Soviet governmental might. It was opened for the 50th anniversary of the October revolution, hence its name, and underwent renovation in 2009. The building’s façade features a huge stained-glass window which relieves the stark geometrical silhouette. The concert hall hosts a variety of actors, rock musicians and dance and ballet collectives. Famous yesteryear stars like Elton John, Dave Brubeck, Cliff Richard, Gina Lollobrigida, Duke Ellington and other more modern names have performed here. Definitely worth visiting! Tips: If you go to the hall by car make sure you come in good time before the beginning of the performance – it’s really hard to find a place to park a car. The concert hall can accommodate about 4000 persons. Shorts and t-shirts are not permitted. 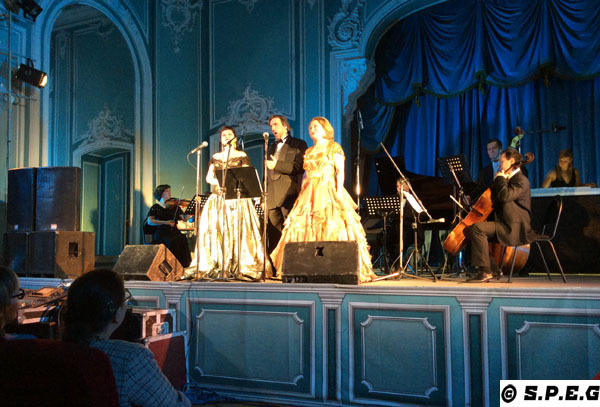 "Majestic Elegance and Russian Classical Music"
Take the opportunity to immerse yourself back to the times of luxury Russian aristocracy by visiting the architecturally elegant Grand Duke Vladimir’s Palace, while listening to Classical music concerts performed by the Russian Musical Seasons Company. Prior to the concert you will be able to view the interesting halls of this Palace and have a welcome drink. The Russian classical music of Tchaikovsky, Rachmaninov and other outstanding Russian composers will be featured. You can also take away as a souvenir a carved profile silhouette of yourself by an artist. Seats are unassigned and the dress code is cocktail wear. Tips: The palace is not open to the public for excursion, so if you want to go you must attend one of their evening music concerts, which are considered by many one of the best St Petersburg concerts. The State Academic Capella is as old as St Petersburg itself, and is considered Russia’s No. 1 choir for its high degree of professional brilliance and name. Not just a choir, but an orchestra with its own concert hall which is the oldest in the city. Founded originally as the residence of the Emperor Court Choir Capella, today with excellent acoustics this is a great venue to come to hear choral events, as well as symphonic, instrumental, and vocal concerts. Many world wide famous musicians in the classical music sphere have performed here, so a visit to this place can be pretty much interesting. Opening Hours: Not available, please check out their website. Tips: This is one of the best place where you can attend some of the St Petersburg concerts and listen to classic music. Great accustic, perfect chorus and orchestra! And still very cheap tickets. Shorts and t-shirts are not permitted. This outstanding ornate century-old concert hall has a rich history and was once called the People’s House Opera Hall. The building was finished by 1912 as the Opera House of Emperor Nicholas II. It also houses a Planetarium. Today it’s mainly known for its ballet performances although musicals are also performed. The talented choreographer Leonid Yacobson brought his ballet company together and it’s only at the Music Hall Theatre that you can see his productions. This is a spectacular place to watch an opera, so pay a visit. There is no strict dress code, but formal or smart casual is recommended. Tips: Expensive drinks and food, so be sure to bring your own. Free garderobe. Shorts and t-shirts are not permitted. To attend any of the St Petersburt concerts presented on this page you can buy tickets on-line through the official website of the hosted venue (recommended), as well as through the following websites: http://bigbilet.ru/; www.bileter.ru; or www.spb.kassir.ru. Also, you can buy tickets upon arrival directly at the box ticket office. However, buying tickets for any of these St Petersburg concerts in advance is recommended as this way you're sure to get the best seats.